VIENTIANE – Machine-gun toting soldiers, police siren ululations, shuttered schools, barricaded streets, grandiose new buildings and stony-faced host leaders were probably the most notable aspects of an otherwise uneventful Asia-Europe Meeting in the Laos capital. The summit, known by the shorthand ASEM, takes place every two years, and this round was attended by French President Francois Hollande, Russian counterpart Dmitry Medvedev and China’s soon-to-be-former Premier Wen Jiabao, among 51 heads of state or government and other representatives from Asia and Europe. Nothing much of substance happened or was said – aside from a robust exchange between Japan and China over the Senkaku/Diaoyu islands – and there were slim pickings for the hundreds of journalists scrambling outside meeting rooms to doorstep leaders as they emerged from meetings. “Prime Minister [Julia] Gillard will not be speaking to press between bilaterals,” admonished an Australian security guard after reporters tried to get the Australian PM’s views on the summit as she strode through the summit hall corridor. Even the Laotian decision to go ahead with the controversial US$3.8 billion Xayaburi dam, announced in the middle of the November 5-6 summit, failed to provoke Cambodia’s Hun Sen or Vietnam’s embattled Prime Minister Nguyen Tan Dung into talking, despite both downstream countries’ previously expressed concerns about the Xayaburi project and the rub-your-nose-in-it timing of Vientiane’s announcement. 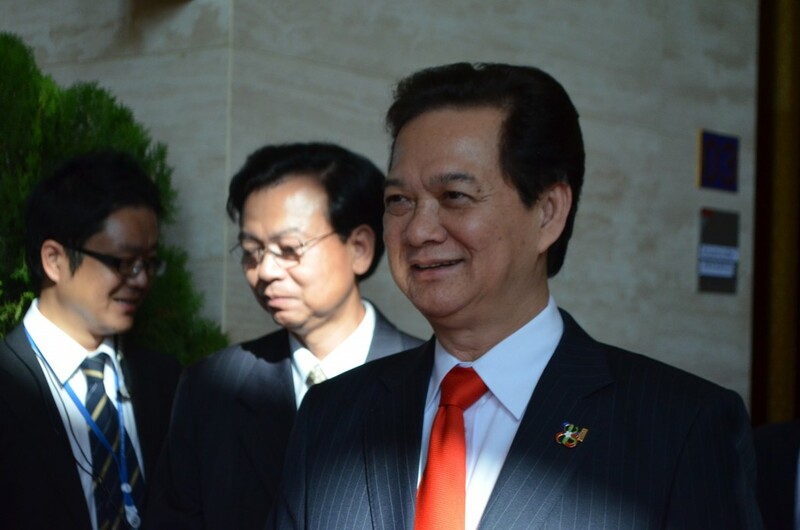 Despite the loss of face, Dung maintained a seemingly permanent smile as he moved to and from meetings, while an attempt to get Hun Sen’s views on Xayaburi were met with a gruff swat of former Khmer Rouge cadre’s left hand and a dismissive-sounding, indecipherable grunt. With China in leadership change mode and the United States in the throes of elections, this summit was pushed to the background, with the upcoming East Asia Summit in Phnom Penh likely to be a higher-stakes affair given US-China rivalry and tensions over the South China and East China seas. 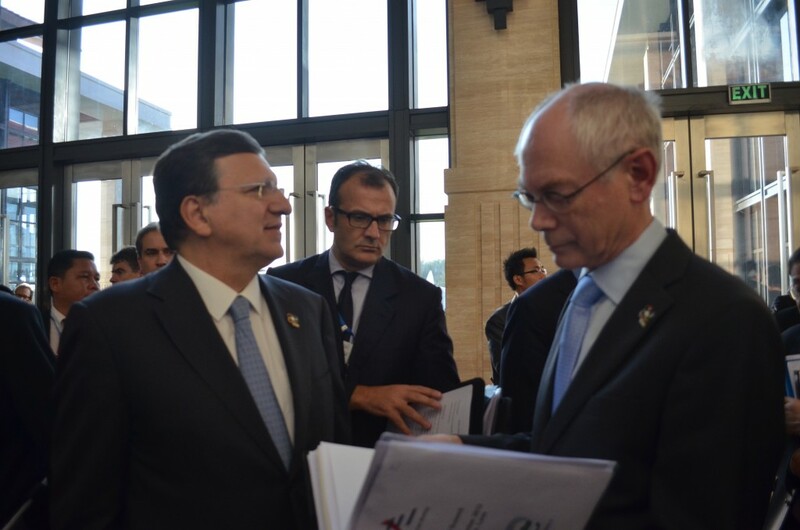 Impressive statistics, and all told the ASEM region covers half of the world’s GDP and 60% of the world’s trade, according the European Council president Herman can Rompuy, but with Europe laboring and the prospect of some “pan-European” solution to the debt millstone facing several of the continent’s economies – where slowdown is hampering export-oriented Asian economies – China quickly stamped its imprimatur on the meeting. “The main economic institutions need to roll out a clear and reliable midterm financial plan as early as possible to solve the sovereign debt crisis,” said Wen, referring to Europe’s various political and financial institutions. With trading countries such as Malaysia seeing reduced exports with struggling Europe, Asian leaders have a clear stake in how the European debt crisis plays out, with some hinting that things need to be done a bit differently. “You cannot get growth if you are saddled with too much sovereign debt, and that needs to be worked out if you will have growth, said Malaysian PM Najib Razak, speaking to Asia Times Online and other reporters at the summit. For their part, European countries want more trade and investment in Asia, and Germany’s Foreign Minister Guido Westervelle said that, “We share an interest in free trade and regulated financial markets,” pointing out that the European Union is pursuing free-trade agreements with India, Japan, Malaysia, Singapore and Vietnam and recently reached such a deal with South Korea. The reality is, however, that the rush of bilateral deals comes off the back of the slow-moving Doha round of trade liberalization and varied trade interests across Asia’s economies. Bailouts for Europe require Asian money, however, meaning that in the immediate term at least, the ball is very much in the eastern court, for now, given China’s growth (albeit slowing) and estimated US$3.3 trillion foreign exchange reserve war chest. Europe has consented to greater Asian representation on international financial institutions and, it seems, on the UN Security Council. The final ASEM summit communique made brief mention of “completing the 2010 quota and governance reform of the IMF” (International Monetary Fund) and in a veiled dig at the United States, “called on the remaining IMF members to take the necessary steps to do so”. Regarding the Security Council, the document said that “comprehensive reform of the UN system remains a priority” with the goal of achieving “a more representative, more efficient and more effective UN Security Council”. Leaders would not be drawn, however, on whether these international institution reforms came up during the summit. 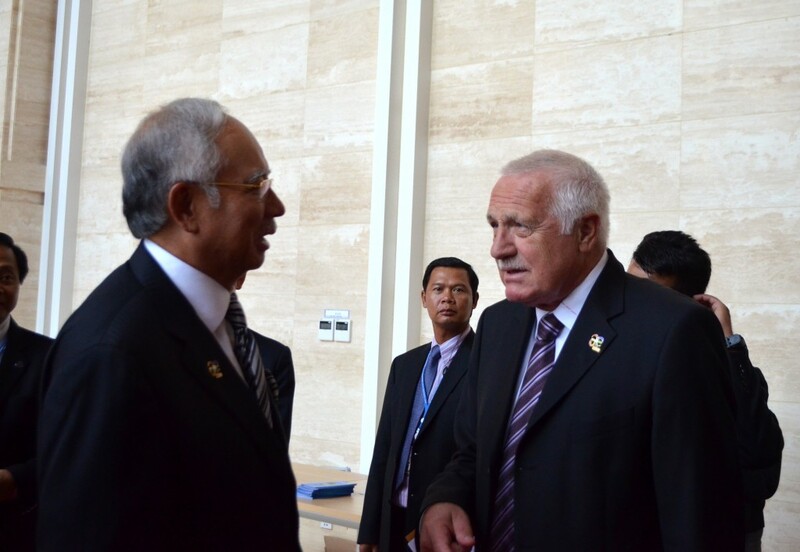 “I would prefer not to comment on that,” Malaysian PM Najib Razak told Asia Times Online. Similarly, Indonesia Foreign Minister Marty Natelagawa reckoned that “there hasn’t been that much discussion of that issue here,” referring to IMF reform.